Innovate Manufacturing proudly announce that our president Mr. Scott Huff has been invited to speak to the Supply Chain Seminar on Thursday Jan-25th at Belmont University in Nashville. As a multinational company, MFG imports a variety of machines and materials from China and export to other regions in the world. It is essential that all inbound and outbound shipments are delivered in time, in budget and in compliance with trade and customs regulations around the world. At innovate, we specialize in one-stop logistic solution for both sea, air and land, full container load and less than container load, import and export shipments between China and the US. With its global footprint across Asia and America, MFG provides manufacturing solutions from conceptual design, prototype, tooling to final production. A rapidly growing business since its inception in 2014, MFG is well qualified to share our great experience and knowledge in managing a supply chain in China for manufacturing. 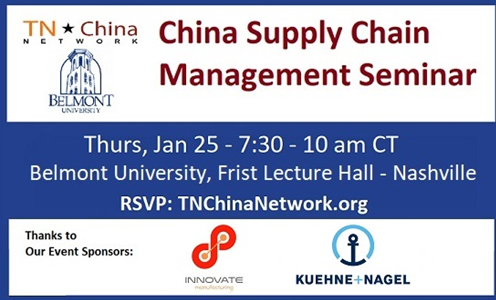 If you are interested in SCM, sign up now and hope to see you there in the seminar!